New guitars, such as this Martin D-28 and this Gibson J-45, can often benefit from adjustments to the nut, truss rod and bridge. The procedure is known as setting up a guitar. 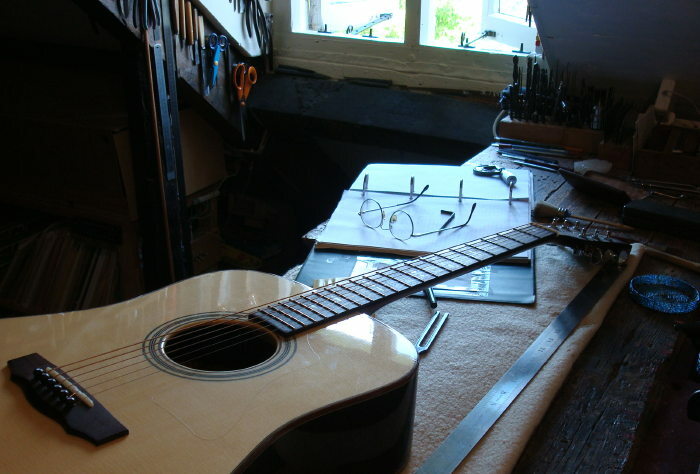 Many guitars need setting up when heavier or lighter strings are used. Old Yamaha steel string guitars have a reputation for easy playing and good tone. This one suffered repeated breakages where the neck meets the head. The head was also damaged on more than one occasion. 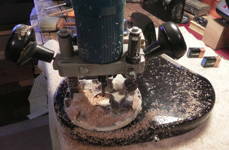 Careful work with a similar mahogony allowed a replacement head to be fitted, with new tuning machines. The repaired neck is on the right. On the right, a very common break. 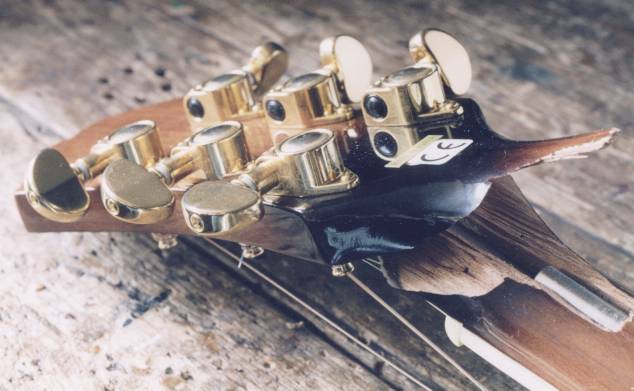 The neck is weakest where it joins the head as it is narrow and hollowed out to allow for the truss rod (which can be seen in the photo). The repair can be almost invisible if carried out very soon after the damage has occurred. 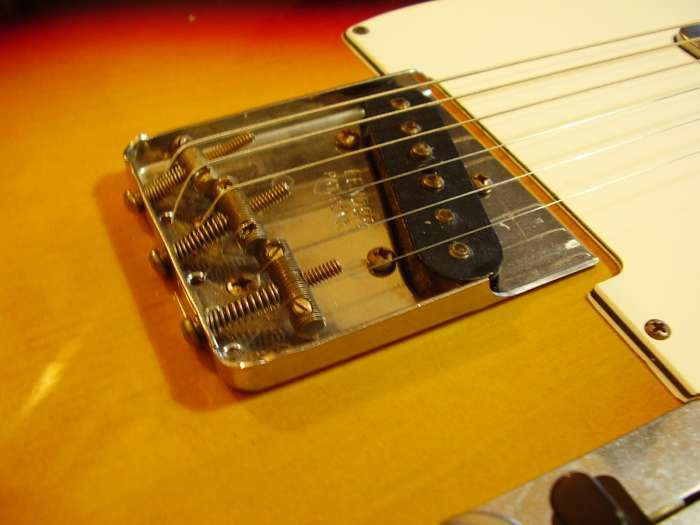 Some Fender guitar players who play with a pick find the bridge sides make it difficult to play close to the rear pickup; on the treble side the bridge gets in the way. Removing a portion of the side is known by Fender afficianados as "clipping the bridge". At the wedding reception, no one admitted to falling on the guitar. 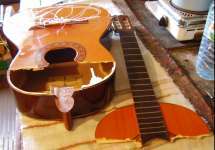 As it was in a soft case, none of the broken wood was lost. Some bars were loose inside and access to them was easy with 1/4 of the soundboard off. The guitar plays as well as it did before the accident. A 30 year old, well-loved and well-played Martin HD-28 received eleven powerful stab wounds from a large screwdriver. 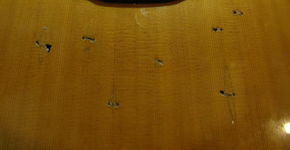 The guitar was referred to my by a repairer in Bristol. It was assumed the repair was hopeless. 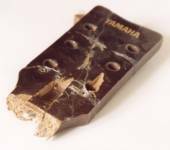 Close examination showed that although the attack was brutal, none of the bars below the soundboard had been damaged. I discussed the project with the owner. At first he wanted to replace the soundboard, but the cost of that was about the same as a new Martin. After several phone calls, he accepted that the repaired guitar would never look as new, but could be completely playable and not look too disreputable from across a room. 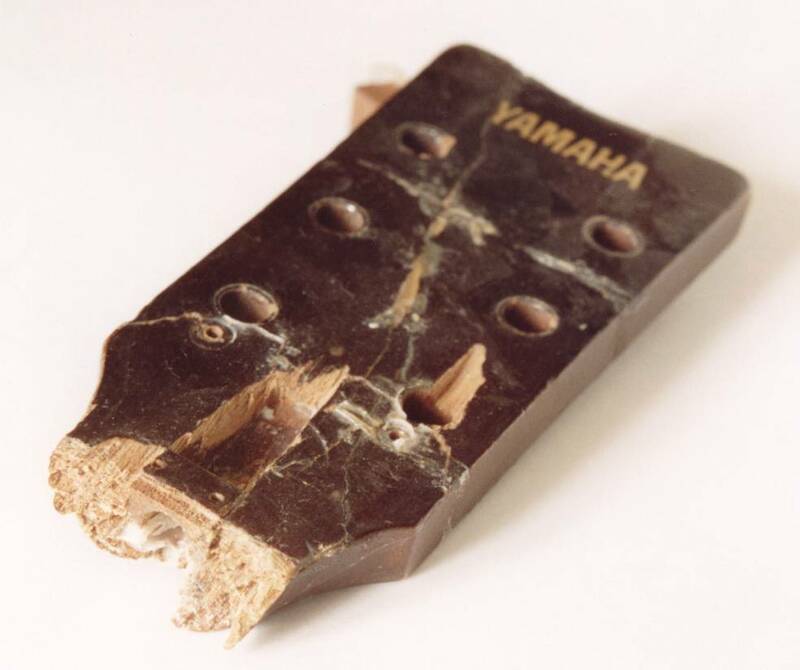 Most of the punctures had left pieces of wood attached to the soundboard. They were hanging, almost hinged, to the underside of the soundboard. I was able to reach inside the guitar and push them back into position. 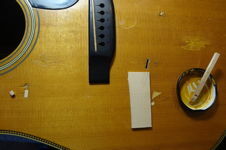 Hot hide glue was applied by fingers inside the guitar, softening the wood and enabling the broken bits to be squished back into position. Hot hide glue is wonderful for this kind of repair. There was already a visual improvement, as shown on the above. I had wood similar to that which was used on this soundboard and found a straight-grained piece with wide and narrow grain. I made patches to fill the holes matching the width of the grain. Where the holes were at an angle to the grain, I made the patch at the same angle. The patches were stained with light oak and coloured with thin coats of varnish. Any gaps were filled with a soft coloured filler. In the above photo, one of the large punctures, between the sound hole and bridge, has nearly disappeared. I thought the result a remarkable improvement. 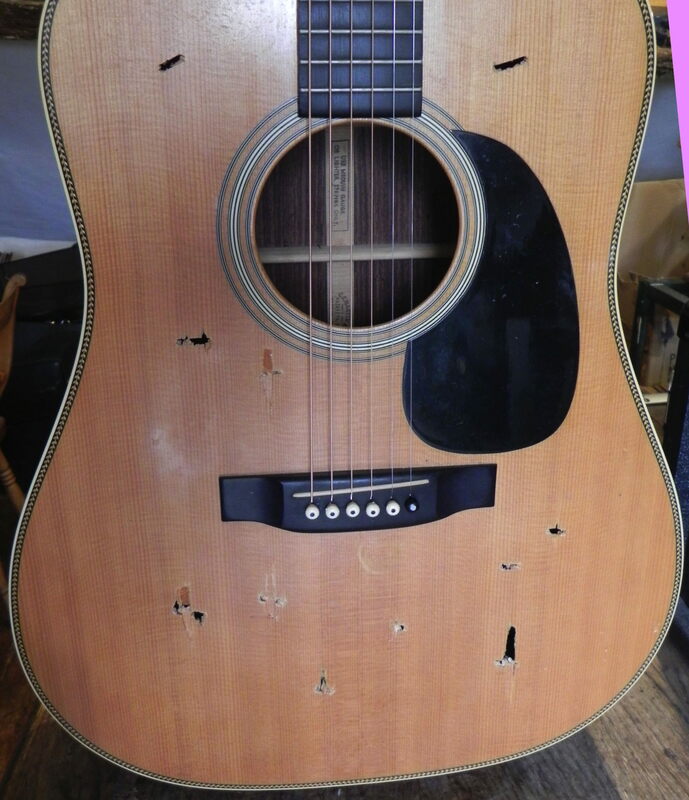 This lovely old Martin nearly ended up scrapped. The owner said: Thank you for persevering until you found the solution to the problem. But he never did thank me for finding a white bridge pin with an abalone eye to match the rest. Three electric guitars on the workbench. A rather nice Hohner Les Paul copy had a broken neck, needed new tuning machines and some wiring problems diagnosed, and set up; a blue Fender Strat in for a refret, some rewiring and a general tidy (a beautiful guitar with plenty of character); and a Japanese Squire in for attention to a Floyd Rose bridge and saddle. Also just the workbench.